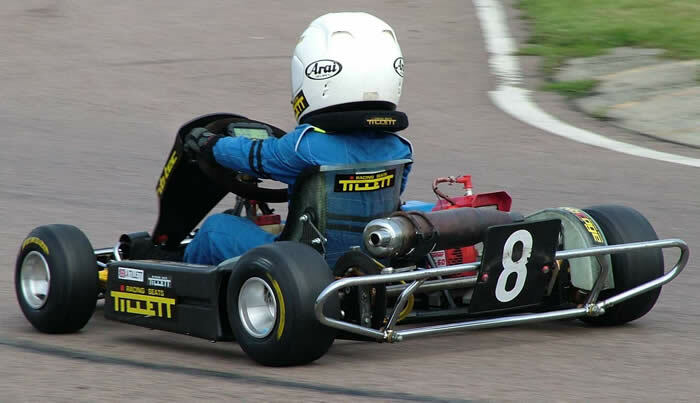 Kart seats are available in many different shapes and sizes but they are not depth or height adjustable, which means that the fit of the seat is nearly always a compromise. Traditionally the only way to achieve this depth was to either use a seat with deepened sides, or to produce a wrap-around seat that curved around the body. 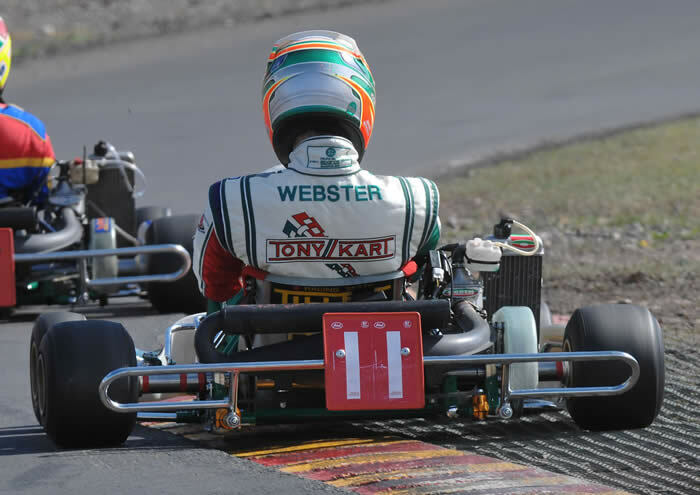 The problem with these ideas is that a deeper seat fouls the arms and a wraparound seat could damage the ribs if a driver were thrown from a kart; even worse injury could occur if the seat were to trap the driver in, rather than let them be thrown clear. 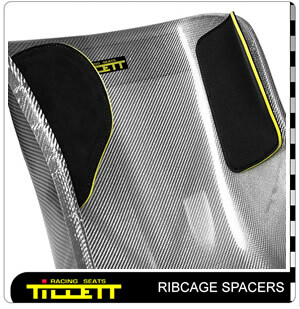 The Ribcage body support system comprises of two “bolt on” panels that give extra lateral support for the upper body. If a driver should be thrown forward or out of the kart when using the Ribcage panels, they are flexible enough to release the driver from the kart. A good tight fit around the chest is essential to help protect the ribs and hip bones from damage. 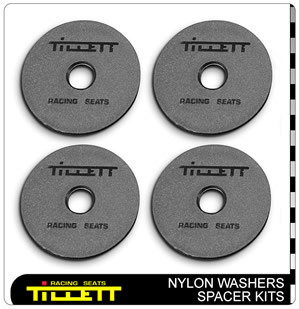 Spacer Kit contains 6 x M8 long seat bolt sets and 18 x 4 mm nylon spacer washers. 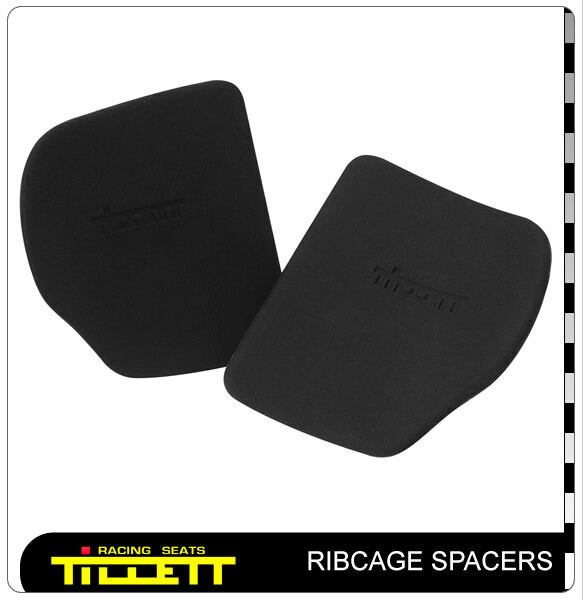 40 mm diameter x 4 mm thick nylon spacer between the seat and Ribcage is recommended. 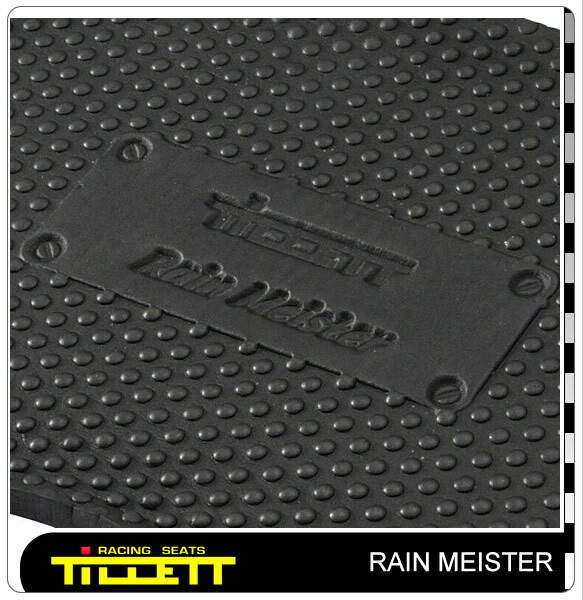 This ensures that the bolts can be tightened sufficiently by crushing the foam completely. 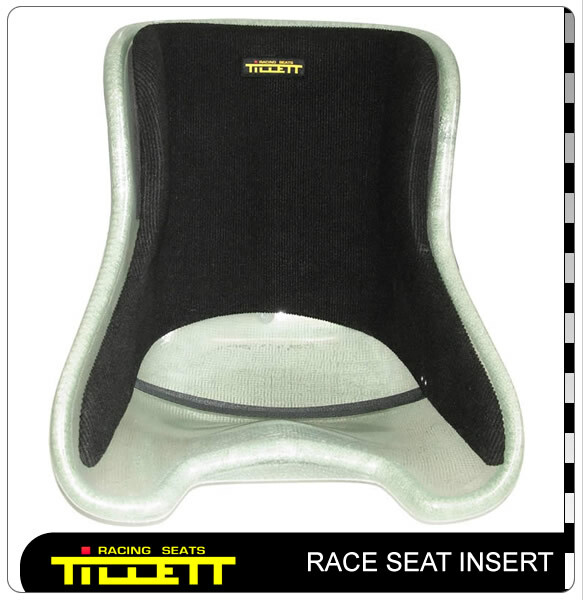 The Tillett Race Seat Insert gives a more personalised and solid solution to the problem of fitting a small driver in a big seat. The important fact with this product is that the driver is still sitting on the base seat which keeps the feel of the kart intact. 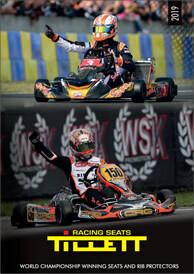 This type of insert is used in endurance racing where more than one driver is to drive the kart and a fast change over is necessary, or it is also very popular in Club 100 "Arrive and Drive" rental racing in the UK, where the kart comes with an XL base seat and there is no chance of changing it. It is typically ordered in 4 sizes S, MS, ML and L. It can also be ordered with a choice of colour, Red, Black or Blue. 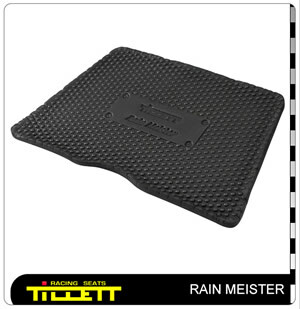 When ordering the options are to have it supplied either with the external hard lightweight foam factory fitted to match the large base seat of your choice, or supplied with sticky foam sheets for the customer to fit themselves. This last option is typically taken when lead is to be fitted to the insert by the customer. 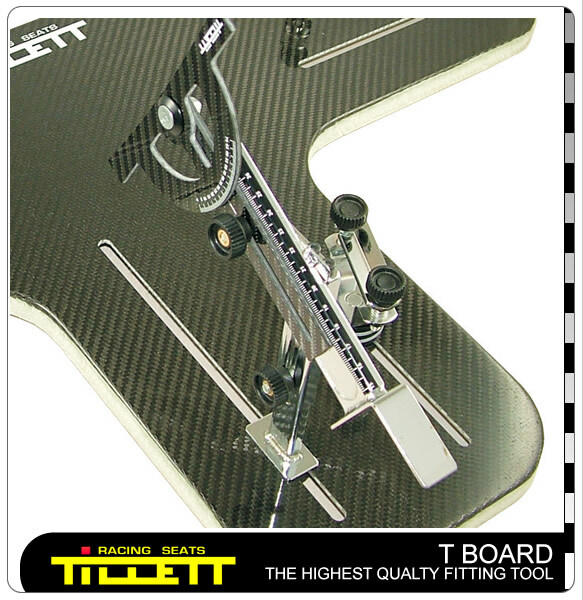 There is also a free of charge option to move the insert forward up to 3 cm which suits the shorter driver. The insert has a strap fitted across the bottom to stop it riding up and is covered and padded to stop it sliding around the back and add comfort. 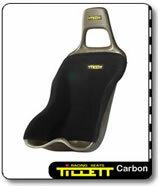 The Race Insert is best ordered by phone to discuss the exact requirements. 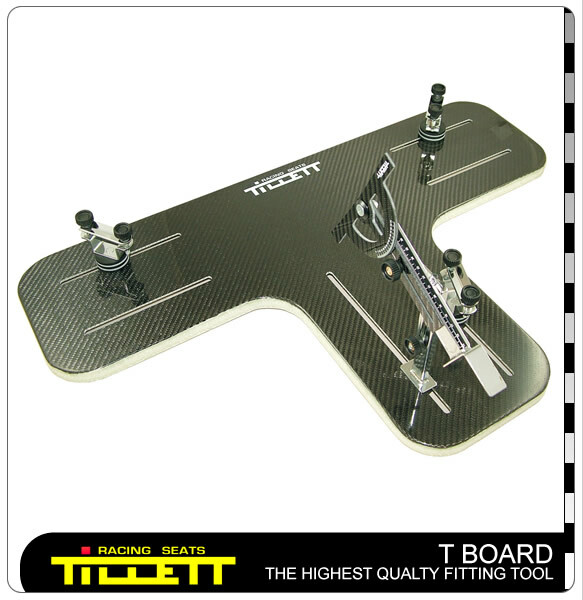 The T Board Seat Fitting Tool gives an accurate way of understanding where your seat is positioned in relation to the rear axle. The measurement point used on the rear of the seat allows different seating angles to be used, while keeping the centre of gravity in a similar position. 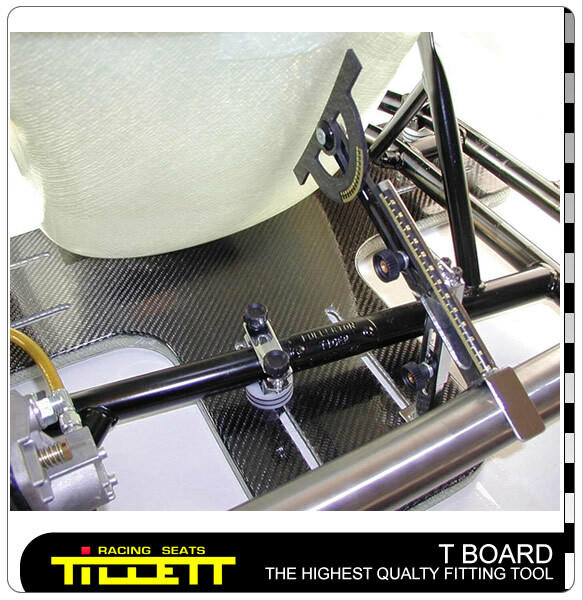 Once set and recorded, it is possible by using the information from the T Board, to place the seat in exactly the same position in relation to the rear axle, no matter what the make or type of chassis. (See the fitting instructions for more information). Sometimes the only way to get grip from a cold, wet or slippery track surface is to put downward pressure on the two outside tyres. On these occasions lifting the seat up will help to get a higher centre of gravity and in certain conditions can help attain extra grip. The problem is that many small tweaks like this can’t be achieved fast enough when it rains. The Rain Meister speeds up the task. 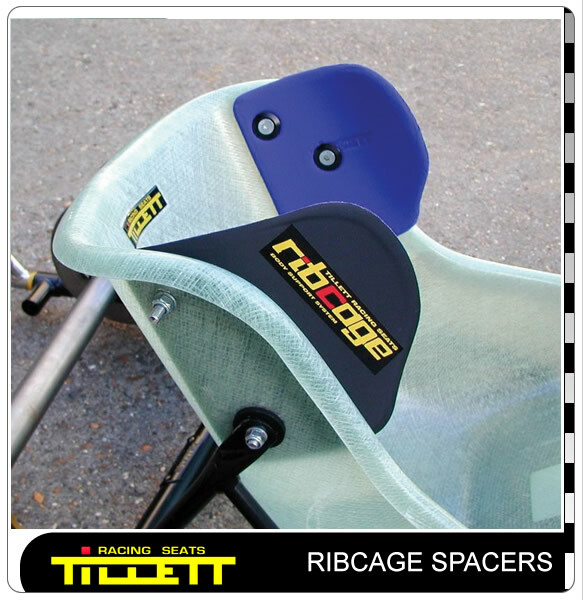 Tillett Nylon Anti seat stay penetration washers and spacers give a solid mounting and take up the gap between the kart seat stays and the seat. The Nylon does not cut into the composite, yet they are tough enough not to fracture or flex. 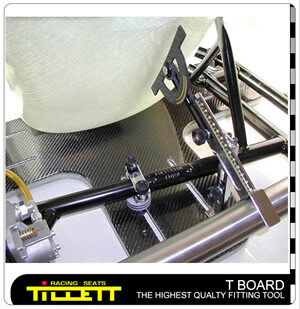 The Tillett nylon anti penetration washers conform to the following CIK and MSA kart seat mounting regulations. All seats must have a metal or nylon reinforcement on all anchorage points between the seat supports and the seat. Reinforcement washers must have a minimum thickness of 1.5 mm and a diameter of at least 40 mm. All supports must be bolted or welded at each end. 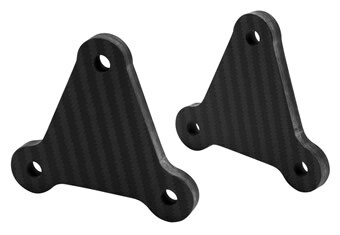 Lightweight carbon exhaust brackets are available to mount the Rotax exhaust. With the addition of two regular aluminium chassis clamps (Not supplied), you can reduce the weight of your exhaust brackets down to a few grams. Sometimes this modification can save .75 kg. The brackets come in a 150 mm and 180 mm lengths. 2 x 180 mm brackets are being used in the picture above. Available in lightweight carbon or 8 mm thick steel these brackets allow a seat to be bolted forward of the main seat stays. An example of when this might be used is when a small junior first gets into an adult kart. This new high specification new stainless steel low profile fitting kit allows a complete seat to be fitted with bolts for four main stays and four extra seat stays. The kit also includes a nylon washer spacer kit to make sure that you have every combination of spacer required to fit a kart seat. 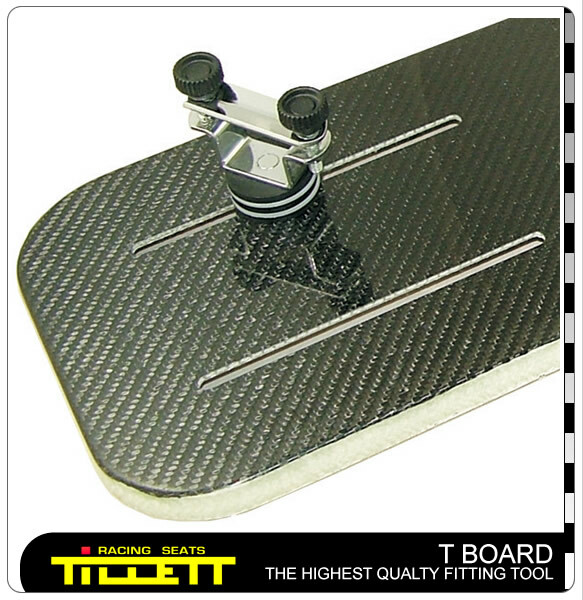 The incredibly flat bolt and washer combination does not destroy you race suit, your rib protector, or your body. They enable you to tighten the seat bolts without fear of the washer pulling through, as they often do with plastic countersunk washers, or bottoming out as they can do will regular steel washers. The design of the washer is such that it allows the head of the bolt to twist in the washer which stops the seat from breaking during the twisting forces generated by the chassis.